China claims most of the disputed sea, which is believed to be rich in oil and gas reserves and is highly strategic for trade and defence.Beijing has built up artificial islands capable of hosting military installations in recent years, stoking ire from claimants like Vietnam, which has emerged as China's most vocal opponent in the waterway. He added both sides should "properly manage differences, not expand disputes (and) respect legitimate rights and interests of the other in accordance with international law". Taiwan, Brunei and the Philippines also have claims in the sea. But the Philippines' China-friendly leader Rodrigo Duterte has backed off disputes with Beijing after a landmark international tribunal ruling in 2016 in Manila's favour. Vietnam's tensions with Beijing in the waterway have largely played out behind closed doors. But violent protests erupted in Vietnam in 2014 after Beijing moved an oil rig into Vietnamese-claimed territory. In the face of continued tensions with Beijing, Vietnam has publicly promoted deepening security ties with the US in recent weeks. Earlier this month, a US aircraft carrier made a historic visit to Vietnam - the first since the end of the war in 1975 - and last week Washington handed over six patrol boats and equipment worth a combined US$20 million to Hanoi. 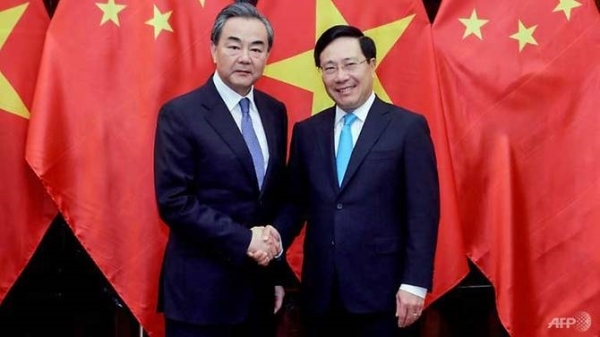 Before his official meetings with Vietnamese leaders on Sunday, the Chinese foreign minister attended a regional summit on economic cooperation in Vietnam, calling for open trade and deriding protectionism. "Protectionism harms others without benefiting oneself, it is a one-way street that leads nowhere," Wang said on Saturday, also lauding Beijing's ambitious Belt and Road initiative that has flooded Southeast Asia with Chinese investments. Observers say China is seeking to boost its trade dominance in the region amid a perceived US retreat from Asia - especially after US President Donald Trump pulled out of the massive Trans-Pacific Partnership (TPP) trade deal last year. Wang, who was promoted to state councillor this month - making him a ranking member of China's cabinet - will leave Hanoi on Monday after meeting with Vietnam's Communist Party chief Nguyen Phu Trong./.